I've been testing and perfecting this recipe for weeks and I'm thrilled to have arrived at a final product! 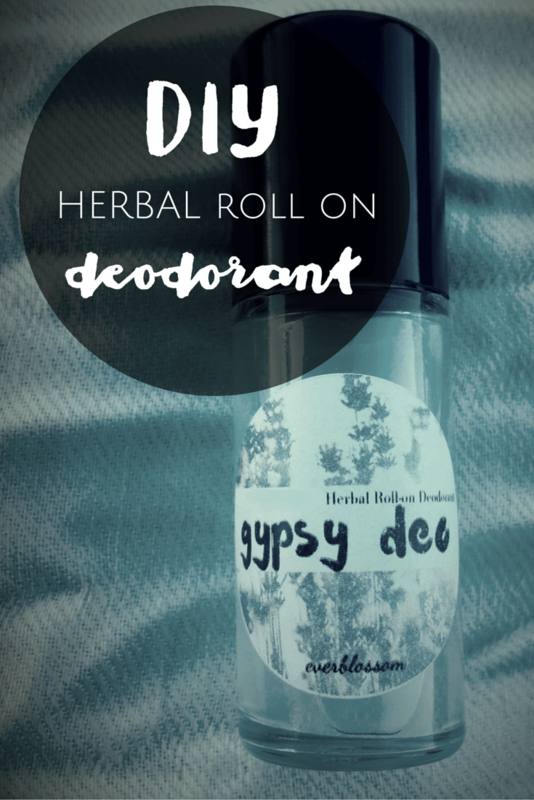 Don't be alarmed by the amount of time I invested, though, because this herbal roll on deodorant is actually quite simple to make. Let me show you how I did it! To make: Simply add all of the ingredients to a roll on glass bottle and you are good to go! To store: I use this 1 ounce glass bottle – they are a bit smaller than standard deo containers, but it's very nice to use and GREAT for throwing in my purse. (Here's a picture of me holding the bottle – so you can get an idea!) I recommend using glass, since essential oils can break down plastic over time. You can also reuse glass over and over many more times, anyway! You could just as easily store this in a spray bottle, too! You can make larger batches at a time, I wouldn't. The roller ball needs to be cleaned out every so often and this is a good amount of product/time to wait between cleanings. 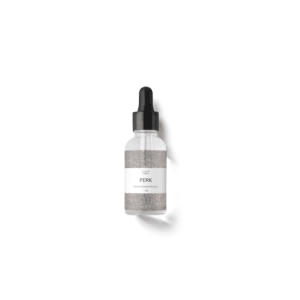 To use: Shake well and apply to underarms. Toss it in your bag to use later. I get around 6-7 hours of protection from this recipe on a normal day. That's all there is to it! Give this recipe a try and let me know how it works for you. Don't want to DIY? Want to try it before you invest in the ingredients? 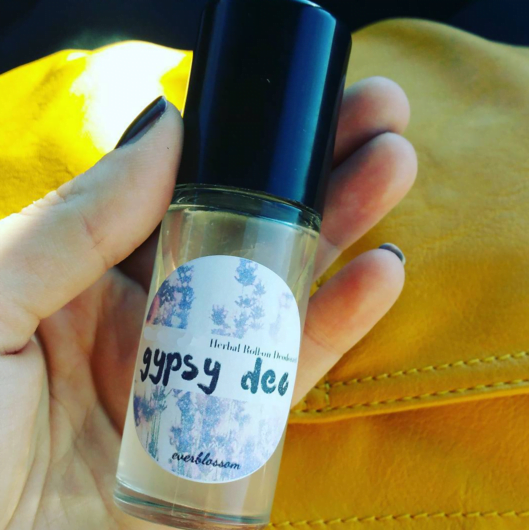 You can buy my Gypsy Deo Herbal Roll On Deodorant in the shop! It's BRAND NEW and ON SALE this week, so grab yours before the price goes up! Don’t Spray Your Dandelions! Do this instead. Kylie, this is awesome! Can’t believe I never thought to put deo in a roller bottle before. This is so perfect for keeping in my purse, especially for those times that I forget and run out of the house without putting some on, haha. So, quick question: what is the glycerin for in this recipe? Just wondering… Thanks! Great question! It’s just acting as a carrier and to bind the ingredients together. I tried various carrier oils, vegetable glycerin seems to work the best. How do you measure 1/8 and 7/8 oz? Thanks! It’s best to use a scale for the most accurate measure. I have had some problems with rashes when using baking soda. Is there a substitute I could use? Is this a problem you have encountered? Thanks! Will this work in a little spray bottle or will the baking soda plug the sprayer? Good question, it might be okay as long as the tube inside is wide enough. In my experience the standard 1 ounce glass amber bottles with spray nozzles don’t work well with recipes that include baking soda.